For example, he says you should always follow your heart and instincts. It will lead you to more happiness and success in your life. Imagine you have the choice between two job offers. Offer A offers a lot of money, an interesting topic, and nice colleagues. Offer B offers less money, the topic doesn’t seem to be the latest and greatest. But somehow you hear tells you to go in that direction. I was in this situation some years ago. I worked as a consultant for a company for 5 months. Suddenly, this company made me an offer. It was well paid, less working hours, better career development, more training and nice colleagues. But somehow my feeling said “No”. I was thinking about it for a long time, especially because of the money. It was much more compared to what I earned. What I earned back then was just enough to pay our bills. Big vacation was not possible. Finally, I refused the offer. Nobody understood why. But I was convinced it was the right decision. It took more than one a half till the next job offer arrived. But this one was the right one. If I would have taken the offer before, I would not be a mentor, I would not be a recognized talent of the company and I would not be writing this blog and sharing my experience with you. I would not be where I am right now. And I really love where I am right now. I followed my heart and it worked out very well. 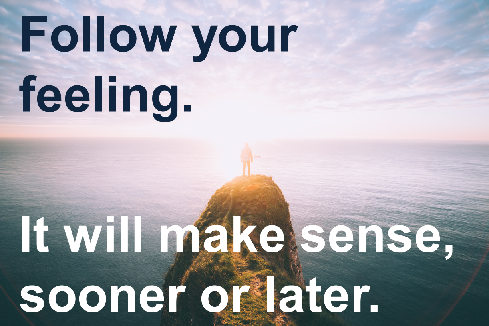 Follow your instincts, intuition, and feeling. Really, it will make sense sooner or later. I hope you find this article interesting and that it helps you to persue what you love to do! Let me know a decision where you followed your heart instead of the facts.